The 2D game is a bike stunt game in the vein of Trials HD. You steer a bike from the start of a level to the end. It sounds easy until you factor in the game’s wealth of crazy jumps, exploding barrels and sinister looking pumpkins that blow you into the sky. There’s a mass of variety in the level designs, with a mixture of developer and user-created levels scattered through the game. Rather than shoving all of its difficult obstacles onto you at once, the game eases you into its mechanic well, with a large number of ‘easy’ levels for you to sharpen your teeth on before really biting into the game’s challenging core. The levels range from easy to seemingly impossible, but mistakes made always feel like yours rather than that of the game. 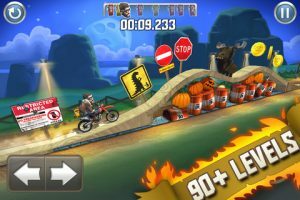 You often find yourself teetering around awkward corners and balancing the bike across obstructive lumps in the track, but are unlikely to get frustrated with the game’s responsive controls and good, if slightly floaty, physics. Each of the game’s levels contains three objectives – normally, ‘collect all of the level’s coins’, ‘complete the level in a certain time’ or some variation. Occasionally, objectives can be a bit more adventurous, such as ‘do 9 backflips’. It would be nice to have a few more unusual objectives like this. When you complete an objective, you are awarded a star, which you can use to unlock a new level. It’s normally quite easy to complete all of a level’s objectives on the first run through of a level, especially early in the game, so although objectives help to make the app more engaging, they don’t really add much to its replayability. If you tire of the game proper and want to try your own hand at designing levels, there’s a comprehensive level creation tool to play around with. 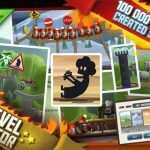 You can make levels that are just as fleshed out as those that come with the app. The level editor has an intuitive interface and is easy to use, although you’ll have to be quite patient if you want to produce something of real worth. Once your level’s complete, you can share it with friends via twitter or by emailing them. 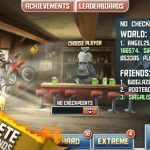 If you’re lucky, your level will also be featured on the Bike Baron website, where you can download the top user created levels. There are a few flaws to the game, with the most notable being the ease with which you can ‘crash’ – if your character so much as touches a nearby surface, you’ll start again from the nearest checkpoint. This is never much of a problem, however, as each level contains a silly number of checkpoints. 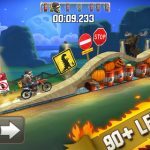 Overall, Bike Baron is full of engaging content. It’s graphically brilliant, its gameplay is first class and its price is tiny. It might not be perfect, but it’s definitely worth a purchase.